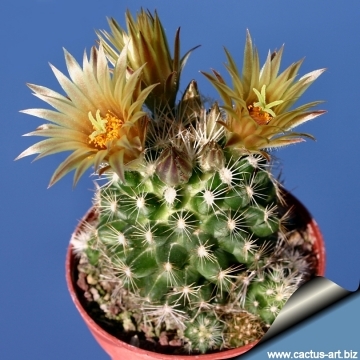 It is one of the most hardy cacti ( to –35°C ) and grows up to the border of Canada (it survives even in Scandinavia, Northern Europe, and without any protection at all). Habitat: Found on dry plains, short-grass prairies and rocky shallow uplands, often on limestone soils and under ponderosa pine and in Pinyon-juniper woodland, or Quercus gambelii, loamy places, often restricted to sedimentary rocks. Neomammillaria missouriensis (Sweet) Britton & Rose ex Rydb. Mammillaria nuttallii var. caespitosa (Engelm.) Engelm. 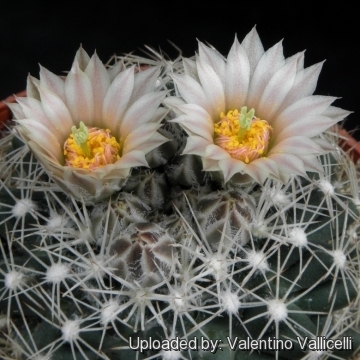 Mammillaria similis var. caespitosa Engelm. Mammillaria nuttallii var. borealis Engelm. Cactus missourensis var. robustior (Engelm.) J.M.Coult. Mammillaria nuttallii var. robustior Engelm. 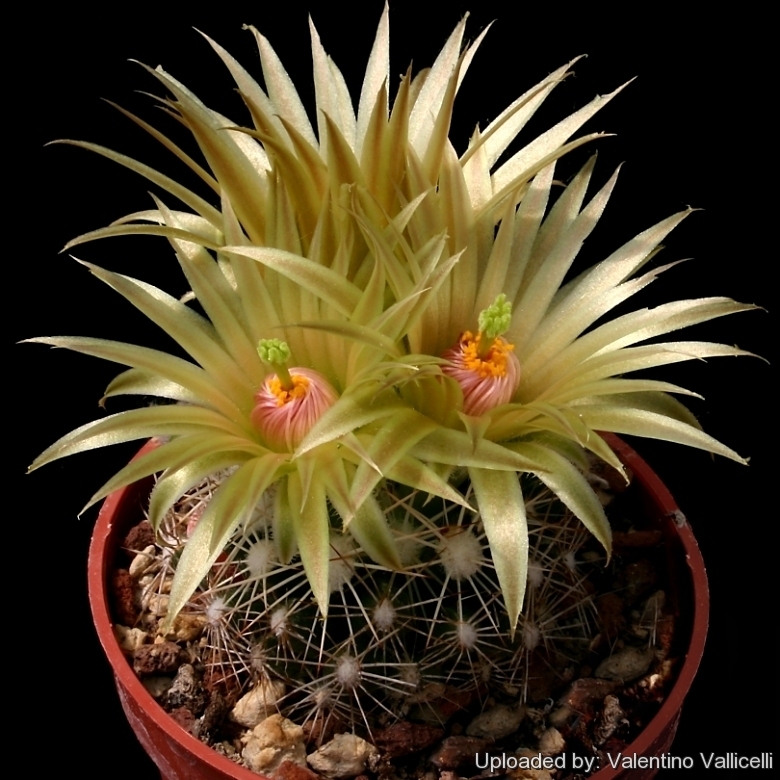 Mammillaria similis var. robustior Engelm. Escobaria similis (Engelm. & A.Gray) hort. Mammillaria missouriensis var. similis (Engelm. & A.Gray) S.Watson ex K.Schum. Escobaria wissmannii (Hildm. ex K.Schum.) hort. Mammillaria wissmannii Hildm. ex K.Schum. 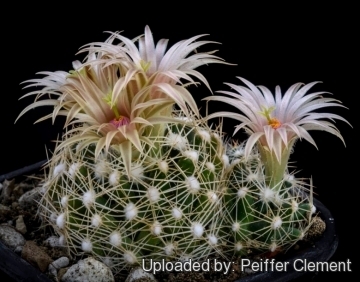 Description: Escobaria missouriensis (a.k.a. 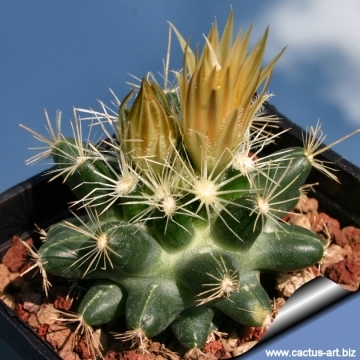 Neobesseya missouriensis) is a low growing winter hardy cactus species. 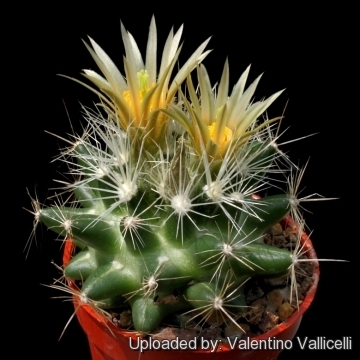 This is one of the most variable species in the genus and has lots of unnecessary synonyms ( like many other cacti) and comprises a multitude of different regional forms as well as various cryptic allied species. But where each form is linked to others by populations of plants with intermediate characteristics. Habit: Unbranched or profusely branched (eastern populations) and occasionally forming clumps up to 30 cm in diameter. Roots: Diffuse or short taproots, sometimes adventitious from bases of branches. Stems: Deep-seated in substrate, becoming flat-topped and nearly subterranean in winter, 2-8 wide, 1-10 cm tall. Tubercles: 5-21 soft; areolar glands absent. Areoles: With short white wool, not obscuring the basal portion of the spine. 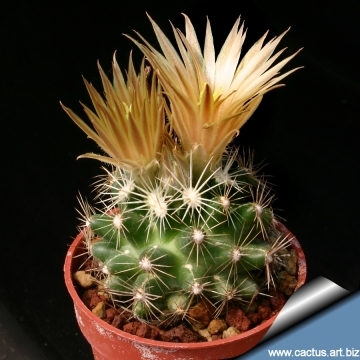 Spines: 6-21 per areole, slightly pubescent, bright white, pale grey, or pale tan, weathering to grey or yellowish brown, dark brownish orange to pale brown or pale greyish pink tips present on all or only the largest plants. Central spines: 0(-3) per areole, if 1, erect, if 2, ascending-spreading, 8-20 mm long. Flowers: Nearly apical, 18-50 mm long, 15-50 mm wide tepals, fringed (rarely entire), pale greenish yellow to yellow-green, with midstripes of green or rose-pink to pale brown. Filaments: Brighter pink than inner tepals, pinkish with greenish white bases, or uniformly whitish. Stigma lobes: 3-7, green or yellowish, 1-5 mm. Fruits: Bright orange-red to scarlet when mature, spheric to ellipsoid, 5-10 mm, slightly succulent but not juicy, floral remnant weakly persistent, often lost through weathering. Remarks: At first glance it seems very much like Escobaria vivipara but the strange copper flower colour and brightly coloured fruit will quickly distinguish it. Though not exactly showy, the straw-yellow, brown, or amber flowers are quite appealing, as are the bright red fruit that persist from late summer to spring. It is variable over its huge range, and worth obtaining in various forms. Escobaria missouriensis subs. asperispina (Boed.) N.P.Taylor: Tubercles to 18 mm long, 9-10 radials, and greenish yellow or cream flowers. Distribution: Southeastern Coahuila and Nuevo Leon. Escobaria missouriensis subs. navajoensis Hochstätter: Plant whith short tubercles (only 2 mm long) and small flowers 2-3 cm in diameter that are yellowish with dark midveins. Distribution: Navajo County, Arizona. Notes: The closest relatives of Escobaria missouriensis are Escobaria asperispina of Mexico and Escobaria cubensis of Cuba. Those species collectively composed the segregate genus Neobesseya, now rarely accepted. Cultivation and Propagation: This plant is extremely frost hardy, adapted to dry soils and is quite susceptible to over-watering if kept in a non ventilated place. It comes from an area of summer rainfall. Watering: Water sparingly and keep it completely dry during winter. Mature individuals easily rot and die especially after transplanting so be extremely cautious with watering. Keep dry in winter or when night temperatures remain below 10° C. Water it less than average if in bigger pots. (but for outdoors cultivation it is very resistant to wet conditions, too). Hardiness: Very cold resistant, but the frost resistance varies a lot from clone to clone. It can easily be grown outdoors in areas with minimum winter temperatures of -15 -25° (but northern populations are resistant to -35 -45°C). In cultivation it is best to avoid severe freezing temperatures. Propagation: Usually propagated from seeds (seldom produces offsets) or graft. The seeds (no dormancy requirement, they germinate best at 25°C) can be sown in pots of fine, well-drained sandy soil, any time during the spring when temperatures are warm. Cover the seeds with a fine layer of grit and water from below with a fungicide to prevent damping off. For the 1-2 weeks cover the pots with a sheet of glass/clear perspex to keep the humidity levels high. Remove the glass and replace it with light shade-cloth and mist once or twice a day for the next two weeks after which most seeds should have germinated. From then on mistings can be reduced to every second and then every third day as the little plants grow. The seedlings should not be disturbed until they are well rooted after which they can be planted separately in small pots. Sometimes it is grafted to avoid root rot problems as plants grafted on an hardy stock are easy to grow and no special skill is required.